Do you know the song from Chicago that starts "Oh yes, oh yes, oh yes, they both reached for, the gun, the gun...."? Until the 'gun' part of the song it really sums up my feelings about this one! Oh yes! The tender pork, sweet apple, savory red wine, and salty parmesan, all on flatbread to soak up the braising liquid crescendo in your mouth! Ok, this may be a bit much but it drives my point home. Try dividing the dough again for 8 appetizer sized flatbreads. This recipe would work equally well with chicken or beef. Preheat oven to 350°. In glass baking pan spread out pork loin in a single layer, salt and pepper on both sides. Cover pork with celery, onion, and apple. Pour red wine over all. Cook uncovered for 35 minutes or until internal temperature reaches 160°. Tent loosely with foil until ready to use. Increase oven temperature to 500°. While the oven is heating divide the dough into four portions, shape your dough into the desired shape, adding as little flour as possible. Poke several small holes in the crust with a fork to prevent bubbling. Transfer pizza dough to whatever, pan, stone, etc you will be using for cooking. Brush crust with a bit of extra-virgin olive oil, and cook without toppings for about 7 minutes. 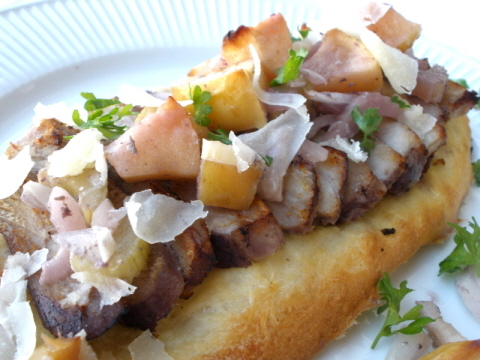 Slice pork into ¼" thick pieces and arrange over partial cooked flatbread. Cook flatbread for about 7 minutes, or until the crust is golden brown. Spoon vegetable mixture and braising liquid over flatbreads. Garnish with freshly grated parmesan and parsley.